‘Kokoda Track’ has since emerged as the politically correct term in Australia in spite of the fact that the battle honour ‘Kokoda Trail’ was awarded to the Papuan Infantry Battalion and the 10 Australian battalions who fought in the Kokoda campaign and the name gazetted by the traditional owners of the land in 1972 i.e. the Government of Papua New Guinea. Immediately after the war against Japan the Australian Government established a Battles Nomenclature Committee to define the battles of the Pacific. ‘The Battles Nomenclature Committee used the ‘Battle of the Owen Stanley’s’ in a provisional list of battles, actions and engagements of the war in the South West Pacific Area produced in May 1947. For the preparation of the final list, Warren Perry, Assistant Director, wrote that the geographic boundaries required further work with ‘very detailed research into the original day to day records of the various campaigns’. The Committee may have deemed that the ‘Battle of the Owen Stanley’s covered a too broader area to describe the Kokoda campaign, suggesting that fighting occurred across the entire range. In June 1949 the provisional list of battles used ‘Kokoda Trail’. The Battle Honour ‘Kokoda Trail’ has been emblazoned on the colours of the Papuan Infantry Battalion and the 10 Australian battalions who fought in the Kokoda campaign for the past 57 years. Battle Honours or colours symbolise the spirit of a regiment for they carry the names of battles that commemorate the gallant deeds performed from the time it was raised. This association of Colours with heroic deeds means they are regarded with veneration. In a sense, they are the epitome of the history of the regiment. This is a significance that commentators and bureaucrats who have never worn the uniform will never fully comprehend.The full history of a regiment is contained in written records, but these are not portable in a convenient form. On the other hand the Colours, emblazoned with distinction for long and honourable service, are something in the nature of a silken history, the sight of which creates a feeling of pride in soldiers and ex-soldiers. The Australian War Memorial is the official custodian of our military history. The Memorial has honoured the battle honour of the 10 Australian battalions by naming the Second World War Galleries ‘Kokoda Trail’. 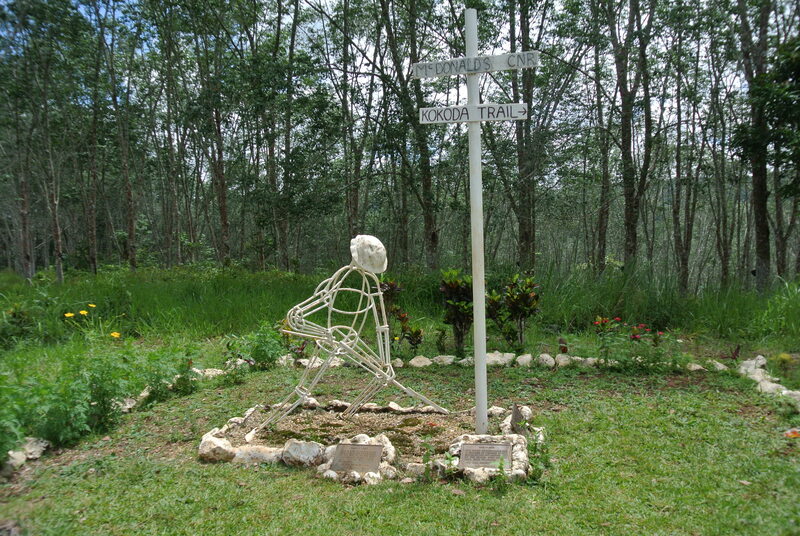 According to the Memorial’s website the ‘Kokoda Trail Campaign’ was fought over ‘a path that linked Owers Corner, approximately 40 km north-east of Port Moresby, and the small village of Wairopi, on the northern side of the Owen Stanley mountain range. From Wairopi, a crossing point on the Kumusi River, the Trail was connected to the settlements of Buna, Gona and Sanananda on the north coast. Its name was derived from the village of Kokoda that stood on the southern side of the main range and was the site of the only airfield between Port Moresby and the north coast. 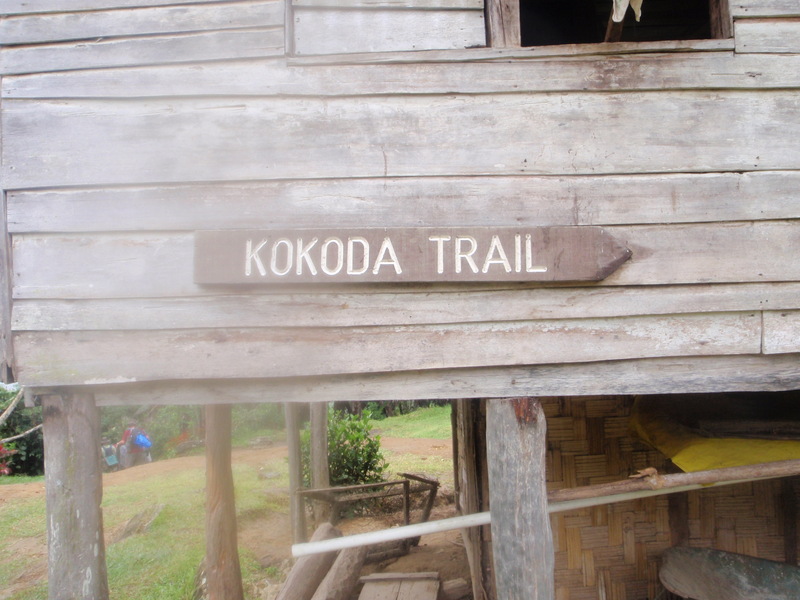 For trekkers the Kokoda Trail lies between Owers Corner and Kokoda. In response to the debate over the official name of the Kokoda Trail, Australian War Memorial historian, Garth Pratten surveyed the Memorial’s collection of published histories of all the major units involved in the Owen Stanley and Beachhead campaigns in 1997. Pratten found that of the 28 published histories 19 used ‘Kokoda Trail and 9 used ‘Kokoda Track’ – a majority of 2:1 in favour of ‘Trail’. Pratten noted that ‘these histories were usually written, edited, or published by men who had participated in the campaign’. It is ironic that 75 years on we now have city-based academics, commentators, bureaucrats and politicians who have never worn the uniform deem themselves to be more of an authority on the issue than those who saw active service in the Kokoda campaign. The RSL is the largest ex-service representative body in Australia. They accepted ‘Kokoda Trail’ as the official title after the battle honour was awarded in 1958. A motion by the NSW Branch of the league to have the Kokoda Trail renamed ‘Kokoda Track’ was defeated at the RSL National Congress held in Dubbo on 14-15 September 2010. The Australian Department of Veterans Affairs and DFAT who have responsibility for the Kokoda Trail in Papua New Guinea refuse to acknowledge the correct title of the battle honour ‘Kokoda Trail’ and the right of the PNG Government to name their own geographic features. According to the DVA website ‘the Australian official historian of the Papua New Guinea campaign, Mr Dudley McCarthy, studied this issue more than any other historian. He corresponded with and spoke to many Kokoda veterans, and the fact that he chose ‘Track’ carriers considerable authority’. If this is true then why do unit histories of the battalions who fought in the Kokoda campaign refer to the Kokoda Trail on a ratio of 2:1? And why did McCarthy take poetic license to caption the map he used on page 114 of his official history ‘Kokoda Track’ when the name on the map clearly identifies the route as the ‘Kokoda Trail’? Dudley McCarthy was a most credible historian however there were many others such as Osmar White and Raymond Paull who were equally credible but had a different view. The Department of Veterans Affairs believe that McCarthy ‘was certainly influenced by veterans, including senior officers such as Brigadier JE Lloyd, 16th Brigade Commander, who said ‘we on the track referred to it as the Track not trail‘. They are obviously unaware that Lieutenant-General Sir Sydney Rowell, former Commander of New Guinea Force during the Kokoda campaign, refers to ‘Kokoda Trail’ in his forward to Raymond Paull’s book, Retreat from Kokoda in 1953. Major General ‘Tubby’ Allan, Commander of the 7th Division and Lieutenant Colonel Ralph Honner, Commanding Officer of the 39th Battalion at Isurava also refer to ‘Kokoda Trail’. ‘On 6 March 2008, at a joint press conference in Port Moresby with the then Prime Minister, The Hon Kevin Rudd MP, and the PNG Prime Minister, Sir Michael Somare, the word ‘Track’ was used nine times and there was not mention of the word ‘Trail’. Both Prime Ministers and the reporters asking questions all used the word ‘Track’. This could hardly be classified as ‘qualitative’ research and indicates that they have far too much time on their hands! What a difference a simple word transition can make! Although the Kokoda Trail is situated within the geographic borders of the sovereign nation of Papua New Guinea their views on the official name have been ignored by Australian academics and armchair historians. Indeed there is no known record of their views ever being canvassed. During the establishment of self-government in 1972, PNG government officials from the Department of Lands decided to examine the name of the mail route between Owers Corner and Kokoda with a view to formalising an official name for it. 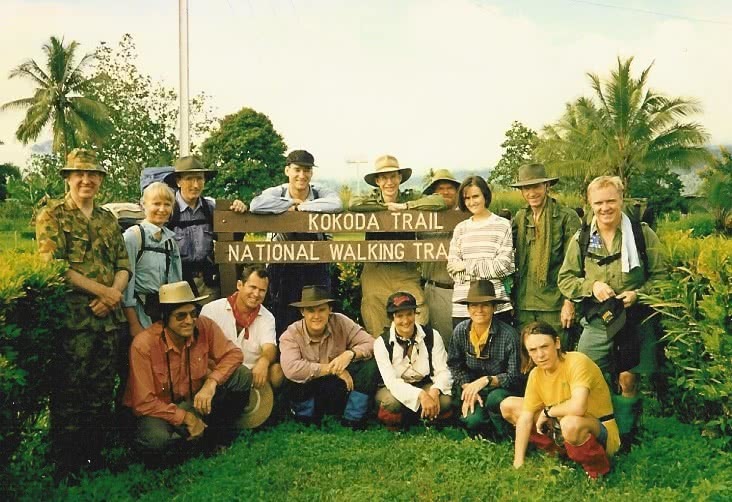 They determined that the name ‘Kokoda Trail’ would be proclaimed. One can assume they would have been influenced by the name of the Battle Honour which had been awarded to their Papuan Infantry Battalion in 1958. Chief Minister Michael Somare assumed office on 23 June 1972 when the nation achieved self-government as part of the process to independence in 1975. Somare accepted the recommendation of the Place Names Committee and the name ‘Kokoda Trail’ was gazetted four months later on 12 October 1972 (PNG Government Gazette No. 88 of 12 October 1972, page 1362, column 2. Notice 1972/28 of the PNG Place Names Committee refers). In a breathtaking display of patronising arrogance bureaucrats in the Australian Department of Veterans Affairs recently advised that ‘the notice included in the PNG Government Gazette of 12 October 1972 was a declaration of the Australian Administration of Papua and New Guinea and not a declaration of the PNG Government!‘ They conveniently ignored the fact that the name ‘Kokoda Trail’ has been on the PNG Government statute books since they obtained independence 40 years ago! Another patronising historian went further when he declared ‘this was a bureaucratic decision, made under the Australian administration, and therefore doesn’t necessarily reflect the view of the people of PNG’ No references were listed to support this fallacy. On the contrary, the view of the people of PNG is reflected in their own publications. Wartime journalist, Osmar White, reported directly from the Kokoda Trail in 1942. Books on his experiences in PNG include Green Armour, Parliament of a Thousand Tribes and Time Now Time Before. These books, along with the ‘Handbook of Papua New Guinea’; ‘Port Moresby, Yesterday and Today’; and ‘Papua New Guinea’ were all published well before the PNG Government gazetted the name ‘Kokoda Trail’. Professor John Dademo Waiko, a former Member of the PNG National Parliament, academic and respected historian published a ‘Short History of Papua New Guinea in 1993. 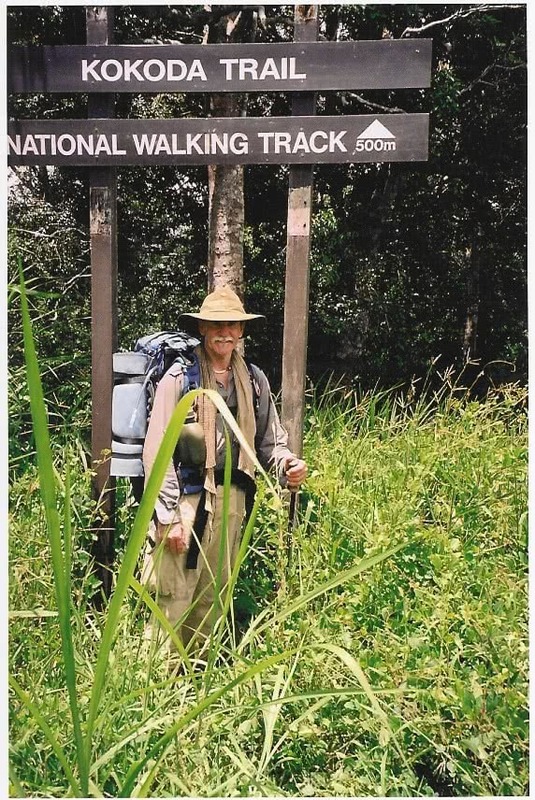 Professor Waiko is from Oro Province which contains a large section of the Kokoda Trail. Handbook of Papua New Guinea published in 1954’. ‘Exploration and development of the early parts of the overland route near Port Moresby began about 130 years ago. In this light, the campaign constitutes a very small part of the track’s history (about a third of one percent) yet the importance ascribed to the WW2 period often assumes a considerably high significance. Of course the Kokoda campaign is very important in Australia on many levels but notwithstanding this, I often wonder whether the presumption that our Australian perspective displaces all others and borders on the arrogant’. These publications span a 70 year period and make a mockery of the statement that the decision of the PNG Government Place Names Committee ‘doesn’t necessarily reflect the view of the people of PNG’. The Royal Australian Survey Corps published a series of 1:100 000 topographical maps in 1974 (Port Moresby – Efogi – Kokoda). The source data for the maps were wartime aerial photographs, sketch maps and survey patrols. The maps identify the original mail route across the Owen Stanley Ranges which are clearly marked ‘Kokoda Trail’. 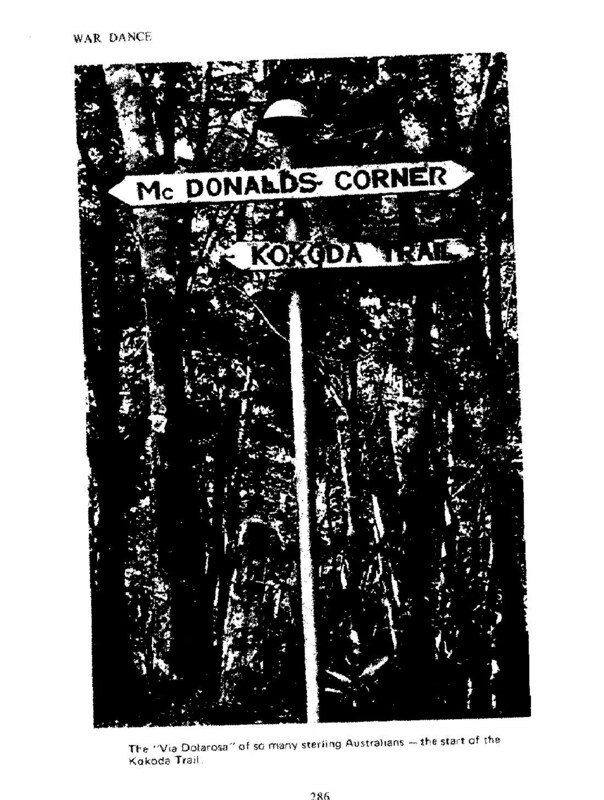 The PNG National Mapping Bureau published a ‘Longitudinal Cross Section of the Kokoda Trail’ in 1991. The map was derived from the Department of Works and Supply, Drawing Number A1/100897 dated May 1982 with field verification by 8 Field Survey Squadron in June 1991 and May 1992. The PNG Department of Lands and Physical Planning produced a 1:200 000 ‘Kokoda Trail Area Map’ of Oro and Central Provinces. There are no known maps published by the PNG National Mapping Bureau which contain the name ‘Kokoda Track’. The Coastwatchers by Eric Felt published in 1946. Crisis of Command. David Horner. 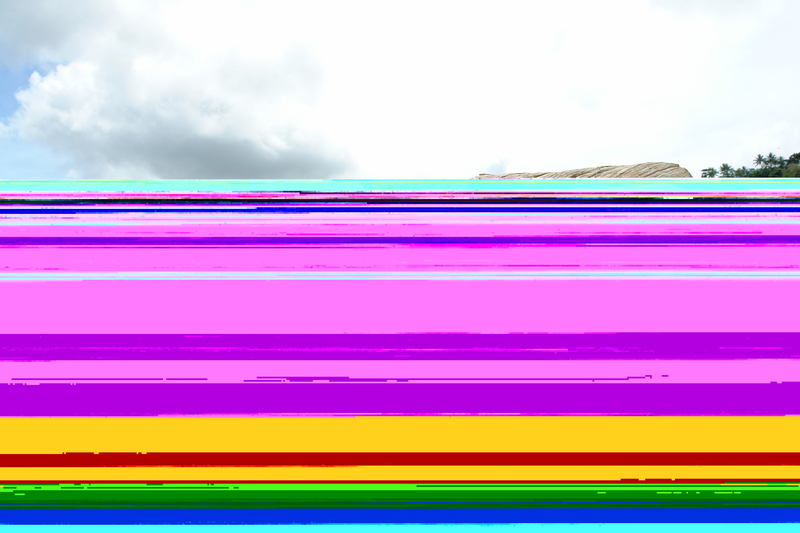 Australian National University Press. 1978. The use of the word ‘trail’ in this context creates an interesting paradox for both the Department and the commentariat. There was not a whimper about the ‘Americanisation’ of our WW1 battlefields in France and Belgium. Why did DVA use ‘trail ‘when they could have just as easily used ‘track’ to identify it as Australian? And why did the commentariat not try to mobilise public opinion against that ‘American’ word that does not reflect their interpretation of the ‘language of the Australian bush’? The decision makes a mockery of their refusal to acknowledge the official name of the Kokoda Trail in Papua New Guinea. It is not surprising that there were so many variations amongst troops and war correspondents in the terms describing the track/trail/path/dala/front/road between Owers Corner and Kokoda because it didn’t have a name. However the four books produced in the 1940s (Jungle Warfare, Khaki and Green, Green Armour, the Coastwatchers and History of the 2/14th Battalion) indicate that ‘Kokoda Trail was the adopted term well before the Battles Nomenclature Committee was established. It is therefore easy to understand why the committee adopted the name ‘Kokoda Trail’ for the battle honour. Subsequent to the awarding of the battle honour ‘Kokoda Trail’ more history books were produced on the Kokoda campaign in the lead-up to self-government in Papua New Guinea. These include the Encyclopaedia of Papua and New Guinea, Blamey, Retreat from Kokoda, a Thousand Men at War, The Brown and Blue Diamond at War and South-West Pacific. All refer to the Kokoda Trail which would have influenced the deliberations of the Papua New Guinea Place Names Committee in choosing ‘Kokoda Trail’ as the official geographic name. It is not recognised by DVA or DFAT since the 50th anniversary of the Kokoda campaign in 1992. Both Departments stubbornly refuse to accept the decision of the Australian Battles Nomenclature Committee or the traditional owners of the land, the Papua New Guinea Government. Their decision to now use the politically correct term ‘Kokoda Track’ in preference to the official name ‘Kokoda Trail’ is a patronising breach of international protocol towards Papua New Guinea – our closest neighbour, former mandated territory, fellow Commonwealth member and wartime ally. It is also highly discriminatory against them. If it is OK for the Australian Government to use ‘trail’ in France and Belgium then surely it should be OK to use it in Papua New Guinea – after all they do own the land! change the name of the WW1 ‘Remembrance Trail’ in France and Belgium to ‘Remembrance Track’ . Until then they should respect the battle honour ‘Kokoda Trail’ and PNGs sovereign right to name their own geographic features. Department of Veterans Affairs letter to Charlie Lyn (sic) dated 23 February 2011 advising why they would not use the official title ‘Kokoda Trail. These books are from my own library – according to Australian War Memorial historian, Garth Pratten, there are many more.